This 11-day road trip across Ladakh lets you explore the vast landscape of the cold desert kingdom with a small group of your close friends. With breathtaking views of barren mountains, you'll travel to some of the most iconic destinations in the valley, including the multi-coloured lake of Pangong and the sand dunes of Nubra. As you travel from Manali to Ladakh and back, you'll also witness the change in scenery from the green meadows of Manali to the brown sand dunes of Ladakh. Travelling over high-altitude mountain passes, you'll explore the winding roads with twists and turns, making memories that will last you a lifetime. Since this road trip is part of a larger motorbiking trip, you'll be accompanied by an entourage of motorbikers. You'll be travelling in the support vehicle that will follow the entourage. Your Ladakh road trip begins in the hill station of Manali. From here, you'll travel north to Ladakh, crossing the state border into Jammu and Kashmir at Sarchu. 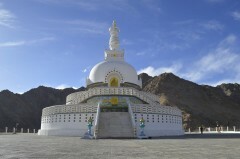 You'll spend a day in the town of Leh and make excursions to visit popular destinations in the valley, including Buddhist monuments like the Shanti Stupa and the high-altitude mountain pass of Khardung-La. You'll spend a night in the Nubra Valley, known for its cold deserts and double-humped camels, and a night by the Pangong Lake, a multi-coloured lake spanning India and China. At the end of these eleven days, Ladakh will be a part of you forever. 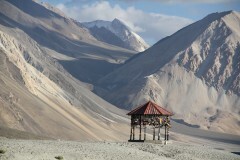 • Get breathtaking views of the barren and brown mountains of Ladakh. • Visit popular landmarks like Nubra Valley, Pangong Lake, and Khardung-La. • Witness the change of landscape from Manali to Leh. 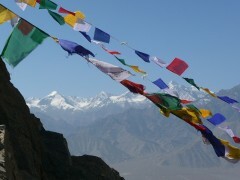 • Experience the culture of Ladakh, with a small group of your own friends. Consumption of alcohol, drugs and tobacco products like cigarettes is strictly prohibited during the trip. For cancellations made 45 days or more before departure date of the Leh road trip: 75% refund. For cancellations made 30-44 days before departure date of the Leh road trip: 50% refund. For cancellations made less than 30 days before departure date of the Leh road trip: no refund. All refunds will be paid after deducting a transaction fee of INR 200 per person. This fee is charged by The Great Next. Since this road trip is part of a larger motorbiking trip, you'll be travelling with an entourage of motorbikers. The entourage will be accompanied by a support vehicle driven by a mechanic, carrying fuel and spare parts for the motorbikes. You'll be travelling in this support vehicle, most likely a Tempo Traveller or similar vehicle. During this Ladakh road trip, travellers will visit destinations at altitudes from 9,800 ft to 13,900 ft and may experience altitude sickness, if proper measures of acclimatization are not followed. 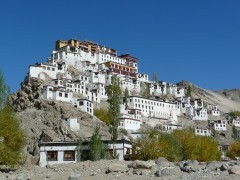 Ladakh is located at an altitude with no internet connectivity and moderate road access/availability of services. Travellers are advised to take such circumstances under consideration before booking this trip. The tour operator takes utmost care to ensure safety of the travellers and shall not be held responsible for any mishap, accident or loss of life and property during the trip. 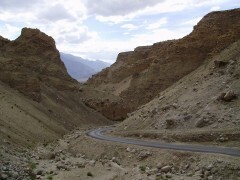 The tour operator reserves the right to alter or cancel the itinerary of this Ladakh road trip due to bad weather conditions or other unforeseen circumstances to ensure maximum safety of travellers. Costs arising due to such changes in the itinerary are borne by the traveller. Arrive in Manali and check-in to your tents at the campsite. The day is free for you to meet your fellow travellers and explore the hill station. If you need to buy any last minute essentials, today is a good day to visit the local marketplace. Overnight in Swiss tents at Manali. Board a private vehicle and begin your road trip across Ladakh on the Manali-Leh national highway. En route, you'll stop at the first check point of the route at the Rohtang Pass, an important mountain pass connecting Manali with Ladakh and Spiti. Overnight in a hotel at Jispa. Today, you'll travel to Sarchu, an important halt point for travellers to Ladakh. The halt point is located to the north of the Baralacha-La Pass, a mountain pass at an incredible elevation of over 16,000 feet. Dramatic views of high rising mountain peaks on the horizon will keep you company, as small hillside villages and towns zoom past your window. Overnight in Swiss tents at Sarchu. Driving over the Tanglang-La Pass, the third highest motorable pass in the world at an elevation of over 17,000 feet, today you'll cross state borders and enter Ladakh. Later in the afternoon, you will cross the Indus Valley and arrive at Leh. Overnight in a hotel in Leh. Over the next few days, you'll be covering long distances at high altitudes, so it is important that you are properly acclimatized. The day is free for you to get used to the altitude. You should get some rest, drink plenty of water, and go for short walks. In the evening, you can explore the city and stop by the local marketplace in Leh. Overnight in a hotel at Leh. Resume your road trip across Ladakh on the national highway heading north from Leh towards the Nubra valley. You'll drive through Khardung-La, the highest motorable road in the world, and into the cold deserts of the Nubra Valley. With rolling sand dunes and scree slopes that stretch into the distance, it'll feel like you're the only ones in the world. Overnight in desert camps at Nubra valley. Check-out from the Nubra Valley and travel to the multi-coloured Pangong Lake via the Chang-La pass, the third highest motorable road in the world at an elevation of 17,590 feet. Spend some time by the lake with sweeping views of the barren, brown Ladakhi landscape. As the sun sets, you can watch the lake changing colours between shades of blue and green. The night sky above the lake is heavily decorated by hundreds of twinkling stars. Overnight in Swiss tents at the Pangong Lake. It's time to head back towards Leh. En route, you'll stop at the Druk White Lotus School, featured in the popular Bollywood movie '3 Idiots'. If you get an early start, you can even visit the Magnetic Hill, where the geology and terrain automatically propels vehicles forward, and the Pathar Sahib Gurudwara, a famous Sikh house of worship. Overnight in a hotel at Leh. Begin your return journey from Leh to Manali and travel back to Sarchu. The vast landscapes of Ladakh, even after a week of travel, appear breathtaking as always. Overnight in Swiss tents at Sarchu. Wake up and set off on the last stretch of your road trip from Sarchu to Manali. Leaving the patchy, mountain roads of Ladakh behind, you'll drive over wide highways and arrive at Manali by early evening. Overnight in Swiss tents at Manali. Enjoy a peaceful morning before you check-out from the campsite in Manali. Your trip ends here. Overnight in Swiss tents at Manali. Arrive at Manali. You'll be accommodated in Swiss tents with attached washrooms at Manali. Today's meal package includes dinner only, but you may visit any of the restaurants in Manali to have extra meals at your own expense. Overnight in a hotel at Jispa. Travel from Manali to Jispa. You'll be accommodated in a hotel at Jispa. Today's meal package includes breakfast and dinner only, but you may visit any of the restaurants or eateries en route to Manali to have extra meals at your own expense. Overnight in Swiss tents at Sarchu. Travel from Jispa to Sarchu. You'll be accommodated in Swiss tents with attached washrooms at Sarchu. Today's meal package includes breakfast and dinner only, but you may visit any of the restaurants or eateries en route to Sarchu to have extra meals at your own expense. Overnight in a hotel at Leh. You'll be accommodated in clean and comfortable hotel rooms in Leh. Couples will be allocated rooms on a twin-sharing basis, while larger groups will be allocated rooms on a triple-sharing basis. Today's meal package includes breakfast and dinner only, but you may visit any of the restaurants in Leh to have extra meals or order from the hotel itself at your own expense. Acclimatize to the high altitude of Leh. You'll be accommodated in the same hotel as yesterday. Today's meal package includes breakfast and dinner only, but you may visit any of the restaurants in Leh to have extra meals or order from the hotel itself at your own expense. Breakfast and dinner will be served buffet-style in common dining areas of the hotel. Overnight in Swiss tents at Nubra Valley. Travel from Leh to Nubra Valley via the Khardung-La Pass. This is when you start to feel even more connected to the Ladakhi landscape when you can hear all its sounds as you fall asleep. You'll be accommodated in deluxe tents with an attached washroom in the Nubra Valley. Today's meal package includes breakfast and dinner only, but you may stop at restaurants and eateries en route to Nubra Valley to have extra meals at your own expense. Overnight in Swiss tents at Pangong Lake. Travel from Nubra Valley to Pangong Lake. Stargazing in the night sky above the lake is an experience you'll never forget. You'll be accommodated in Swiss tents with attached washrooms beside the lake. Today's meal package includes breakfast and dinner only, but you may stop at restaurants and eateries en route to Pangong Lake to have extra meals at your own expense. Travel from Pangong Lake to Leh. En route, visit monuments and places of attraction. You'll be accommodated You'll be accommodated in a hotel at Leh. Today's meal package includes breakfast and dinner only, but you may stop at restaurants and eateries en route to Leh to have meals at your own expense. Travel from Leh to Sarchu. You'll be accommodated in Swiss tents with attached washrooms at Sarchu. Today's meal package includes breakfast and dinner only, but you may visit any of the restaurants or eateries en route to Sarchu to have extra meals at your own expense. Travel from Sarchu to Manali. You'll be accommodated in Swiss tents with attached washrooms at Manali. Today's meal package includes breakfast and dinner only, but you may visit any of the restaurants or eateries en route to Manali to have extra meals at your own expense. Your trip ends by late morning. Today's meal package includes breakfast only. You'll check-out of the hotel after breakfast. Your trip ends here. Manali is well-connected to most major cities of the country via frequent flights by major airlines to the city's Kullu-Manali Airport (KUU). The exact coordinates will be communicated after confirmation of booking.